The Media Diversity Institute is seeking participants for a media relations training for Civil Society Organisations/NGOs who are involved in combating discrimination and championing the rights of vulnerable groups, to be held in London on 25-27 October 2013. The goal of this workshop is to raise the capacity of NGOs to communicate their messages to and through the media. It will be run by an experienced media relations trainer and journalist, and will consist mainly of hands-on practical and interactive exercises, including on-camera interview practise. Topics to be covered will include: what journalists want, selecting media friendly aspects of NGO work, clarity of language and message creation and presentation. This free training programme aims to enable journalists to recognise discrimination, hate speech and stereotypes, and to learn how to adequately deal with them. The training is part of the project ‘’Address of Human Rights –Journalism”. It will take place in Anupriškių k. 2, Lithuania between 10th and 13th of October 2013. 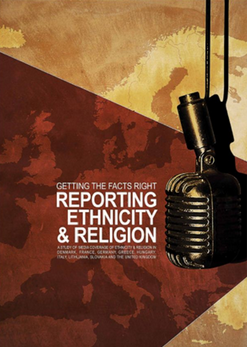 The training is aimed at journalists who believe that there is no place for racism, xenophobia or hatred in the media. It will bring together 30 journalists from several European countries and will be led by well-established human rights and journalism experts. All costs will be covered by the organizers. The International Center for Journalists (ICFJ) offers an online course for reporting on gender, health, education and religion. “International Coverage of Gender, Health, Education and Religion," is a free six-week seminar from 24th September to 2nd November. This course will bring together international journalists to critically examine the portrayal of women in religion, and explore related issues of health and education. It aims to provide an understanding of the breadth and diversity of the role of women in religion, and opening up their vistas to the critical role religion plays in shaping health and education policies. The seminar will be offered in English and Arabic and is designed to be a lasting resource for journalists leading the field in excellence in religion writing and reporting. The regional project “Coalition for Trust” is open for applications from students, civil activists, and journalists who are residents in South Caucasian countries and regions (Armenia, Azerbaijan, Georgia, Abkhazia, South Ossetia and Karabakh). The aim of the project is to strengthen understanding and trust between people in a region characterised by conflict and human rights violations. Starting in June 2013 in Tiblisi, the training will take place throughout the next two years. Attendants will take part in six seminars, as well as in meetings, study trips, public discussions and TV-debates on peace/trust building and reconciliation issues. Workshops are held in Russian and Georgian. Encouraging journalists to see their societies the way they are (diverse, multicultural and pluralistic), rather than homogeneous, was one of the main aims of the workshop for journalists in Ufa city, capital of the Russian Republic of Bashkortostan. The Executive Director of the Media Diversity Institute (MDI) Milica Pesic, and Web news Journalist at The Norwegian Union of Journalists, Eva Stabell, were the trainers of the workshop called "Responsible Journalism: Setting the Standards for Reporting on Social Diversity”. More than 30 journalists, mainly directors and editors in chief, from local agencies of the Russian republic participated in this 2-days workshop. The purpose of the training was to help journalists to improve their professional skills through fair, well- researched and sympathetic coverage in order to represent better diversity in society. The participants discussed ideas for the features that reflect diversity of life experience throughout the region. They also addressed core principles on ethical/responsible journalism, such as tolerance and anti-discrimination, impartiality and objectivity, codes of conduct, eliminating prejudice and xenophobia. The local journalists and the Republic of Bashkortostan Union of Journalists found the training very informative and effective, and appreciated that the theory was closely connected with the practice. The workshop was organised by the Russian Union of Journalists, The Norwegian Union of Journalists, and International Federation of Journalists. Promoting an inclusive and accurate journalism for 15 years, executive Director of the Media Diversity Institute (MDI), Milica Pesic, shared her experience with the participants of the workshop in Tirana, Albania. Pesic and Hassan were training 16 reporters from Albania and Montenegro giving them an opportunity to learn from the examples of work for and with the media to cover diversity. In the examples were included media from the U.S., Southeast Europe and Western Europe that Hassan and Media Diversity Institute have been working with. Representatives of the Roma, LGBT, and disabled communities visited the course in Tirana as special guests, giving presentations and then agreeing to be interviewed by the reporters.